Coelacanths were believed to have gone extinct more than 80 million years ago (Mya) until the sensational rediscovery of one surviving member of this lineage, Latimeria chalumnae, in 1938. Since then, more than 200 coelacanths have been caught off the Comoro archipelago near the eastern coast of Africa in the Indian Ocean (Forey, 1998). The discovery of the second species of coelacanth off the coast of Sulawesi, Indonesia, in 1997 surprised the scientific community. The extensive interviews with Indonesian fishermen, combined with the vast distance from the Comoro archipelago, supported the idea that the Indonesian coelacanths are part of an established north Sulawesi population, and not simply waifs from the Comoran population (Forey et al., 1998). However, taxonomic confusion raised by overlapping morphological variations has posed problems in relation to coelacanth dispersal and biogeography. The Indonesian coelacanth is morphologically similar to the Comoran coelacanth (Erdman et al. 1999). Only one important morphological character is that of scale ornamentation (Holder et al., 1999). We estimated the divergence time between the two species of coelacanths based on the whole mitochondrial genome sequences using Bayesian approach (see Divergence Time Estimation). Estimated divergence time between two coelacanths fell in the range of 40-30 Mya. 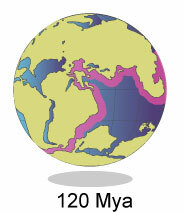 This age was much older than those of the previous molecular studies (< 6.3 Mya). Based on the molecular evidence, we evaluated the several alternative hypotheses about the speciation of the two coelacanths. 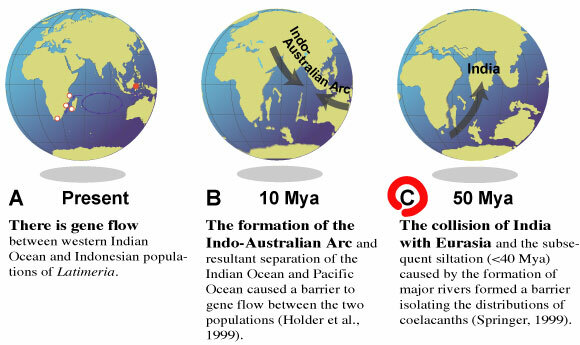 Assuming that the most recent ancestor of the two living coelacanths was distributed along the coasts of Africa through Eurasia (Springer, 1999), three alternative models have been proposed to explain the evolutionary history of the two coelacanths. The estimated divergence time between the two coelacanths (about 40-30 Mya) makes Springer's biogeographic hypothesis (C) as the most likely explanation. 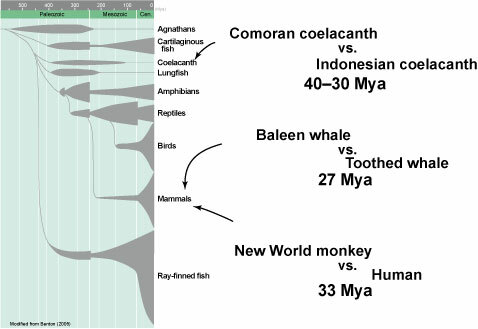 The estimated divergence time (about 40-30 Mya) between the two coelacanths is comparable to those between some major lineages of mammals, for example, baleen whales versus toothed (27 Mya) or New World monkeys versus humans (33 Mya). 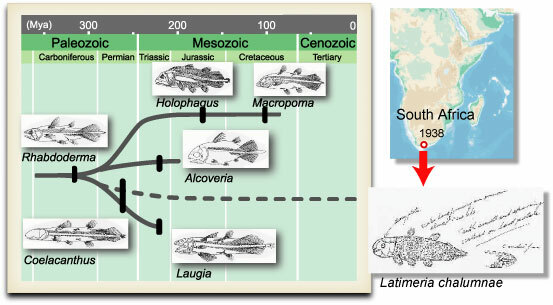 The split between the two coelacanths occurred during the early Oligocene, which was much deeper than expected from the fact that they were classified within the same genus Latimeria. In contrast, the divergence between suborders of cetaceans or infraorders of primates is reasonably deep in light of their classificatory status. These observations highlight the exceptionally high morphological conservation among the Latimeria species. Inoue, J. G., Miya, M., Venkatesh, B., Nishida, M. 2005. 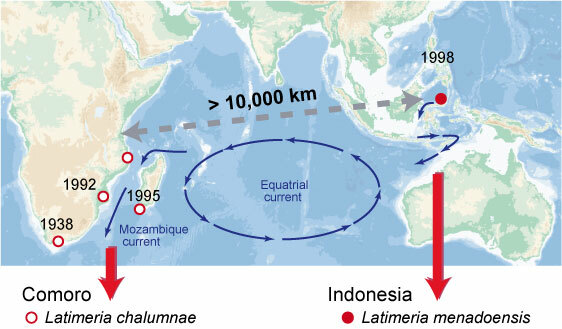 The mitochondrial genome of Indonesian coelacanth Latimeria menadoensis (Sarcopterygii: Coelacanthiformes) and divergence time estimation between the two coelacanths. Gene 349, 227-235.